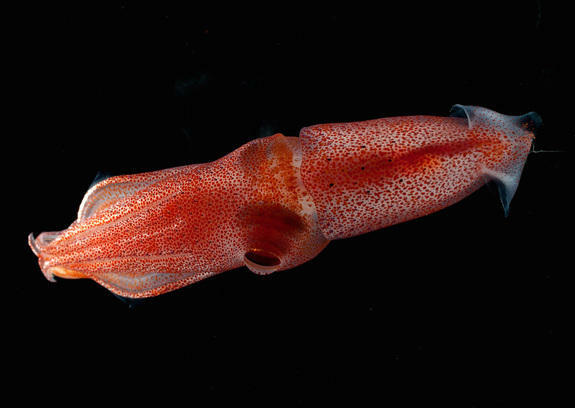 The quirk that helps cockeyed squid navigate ocean's "twilight zone"
As its name implies, the cockeyed squid has some peculiar peepers: One is small and black, and the other is exceptionally large and yellow. Now, scientists think they know the reason for the squid’s wonky eyes: They help the squid spy on prey and predators in the ocean’s so-called twilight zone. This squid species’ mismatched eyes have long puzzled scientists since its discovery about 100 years ago. Cockeyed squids (Histioteuthis heteropsis) are born with eyes that are the same size, but the left eye rapidly enlarges and becomes semi-tube-shaped during juvenile development, sometimes reaching twice the size of the right eye, the researchers said. “You can’t look at one and not wonder what’s going on with them,” Thomas said. To investigate, Thomas and her colleagues watched 152 underwater videos of cockeyed squid in Monterey Bay taken by remotely operated vehicles (ROVs) from the Monterey Bay Aquarium Research Institute (MBARI) over the past 30 years. The researchers noticed that H. heteropsis swam in a strange upside-down position, with its head down and its tail up. Intriguingly, the squid’s large, left eye consistently looked upward, and its small right eye steadily stared downward, the researchers found. Visual simulations showed that the large eye likely looks for shadows of marine life swimming overhead, while the small eye scans for flashes of bioluminescence below it, Thomas said. They came to the “bioluminescent” conclusion because it would be almost impossible for the downward-pointing eye to see silhouettes with the sun’s dim light shining above, the researchers said. Moreover, whereas expanding the size of the large, upward-pointing eye improves its ability to see in dim light, increasing the size of the downward-facing eye doesn’t affect its sensitivity to discern bioluminescent flashes against a dark backdrop, they said. This visual adaption likely helps H. heteropsis survive in the so-called twilight zone, a region from about 660 feet to 3,200 feet (200 to 1,000 meters) under the water’s surface, the researchers said. The results will be published online Monday, Feb. 13, in the journal Philosophical Transactions B.